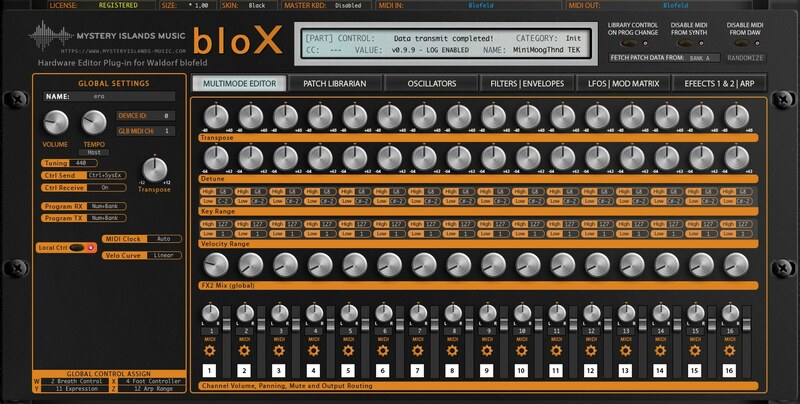 Waldorf bloX is an AudioUnit and VST Editor / Librarian plug-in to control Waldorf Blofeld desktop / Blofeld Keyboard hardware synthesizers right from your DAW. This plug-in works as AudioUnit and/or VST plug-in in all DAWs. Download the DEMO today, read the setup guide and give it a go, it will be worth it! 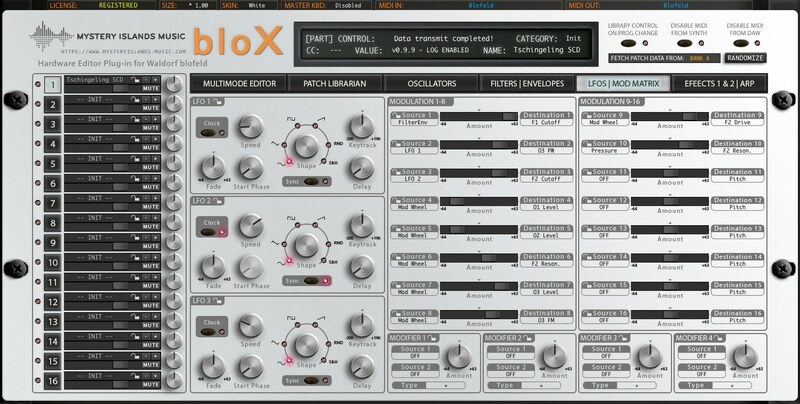 Waldorf bloX AudioUnit & VST Editor / Librarian DEMO downloads - DEMO limitations can be found from FAQ tab below. 32-bit Demo available at Downloads Tab. 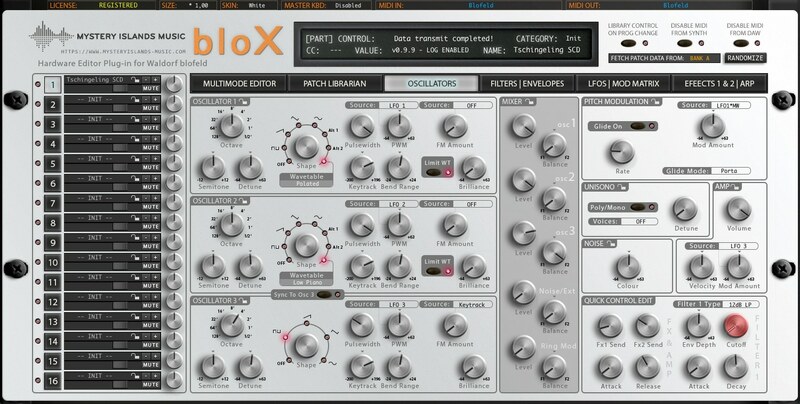 Waldorf bloX AudioUnit & VST Librarian Editor Plug-in, for one of the best synthesizers to date, Waldorf Blofeld series. 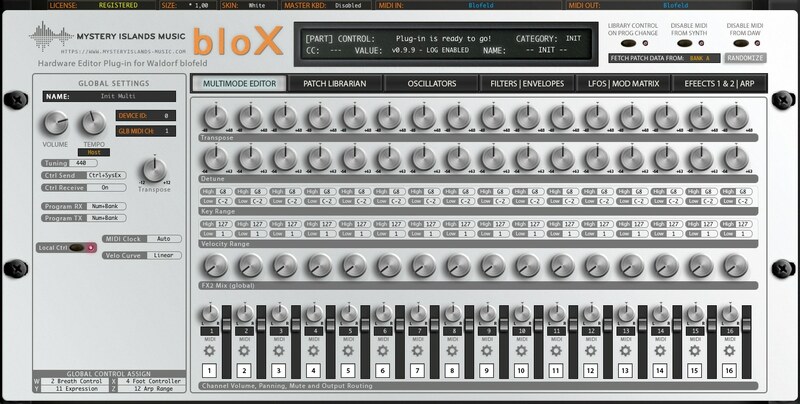 Faster control and automation access than ever, bloX takes your Waldorf Blofeld into a whole new level in the game! Control the same way you use your VSTi and AudioUnit plug-ins. Connect your Hardware seamlessly into your DAW. 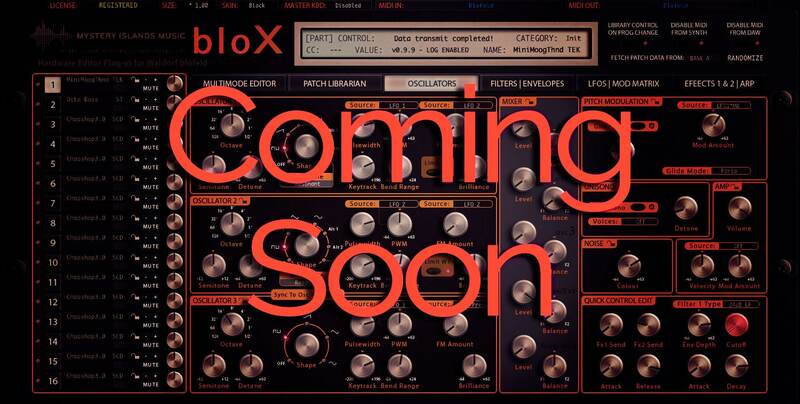 bloX will recall your patch settings when you open your project and the data will be sent to your Waldorf Blofeld-series automatically once you open your project. The only thing you need to worry, is that you power-up your synth. We also added the ability to load in Waldorf microQ and Q patches! (WHAT? Yes!) You can run our plugin in Mac AudioUnit & VST format and PC VST format (both 32 & 64bit). 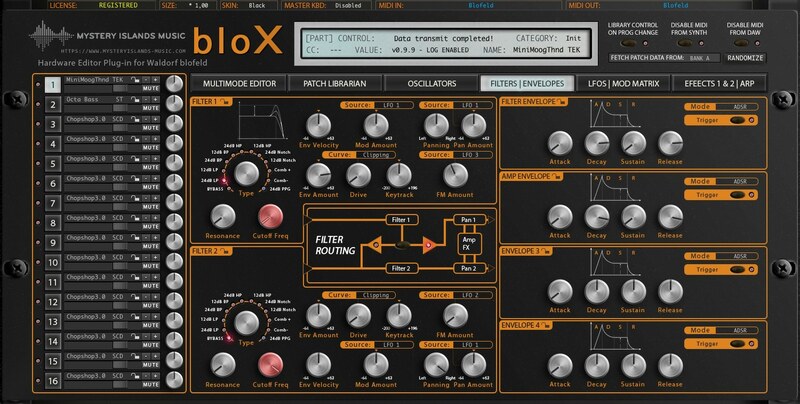 Since there are a lot of great software synthesizers in the markets today and because they are so fast to use, we wanted to bring this functionality to every producer out there with bloX plugin and Waldorf Blofeld. It is now much faster to scroll thru patches & make edits within your DAW. The best part is, when you reopen your project, you don’t have to worry about the patch data you had on your synth while producing: Our plugin stores all the data within the project and when you reopen the project, all of the used data gets sent to your hardware, automatically! No more external applications for saving, loading or transferring patch data. Welcome total recall. Control Waldorf Blofeld desktop / Blofeld Keyboard synthesizer directly from your DAW. Automate almost every parameter directly from your DAW. No need to remember CC’s for each knobs / per synthesizer. Goodbye sticky notes! Load, Edit and Store patches into hardware memory or in your HDD personal library. Store any Waldorf microQ / Q / Blofeld compatible soundset in your HDD library folder and browse it from our plugin. Send banks or individual patches from librarian to hardware. Request banks or individual patches from hardware to librarian. Total Recall: When you reopen your project, all of the data used in it, will be sent to the hardware, automatically! Check Specifications tab for more info about the plug-in capabilities. It is very easy to setup our plugin and to start using in your productions. Just follow the steps below and you can’t go wrong. Check our forums for more guidance and troubleshooting. Fire up your DAW and head to settings. Make sure MIDI input from the terminal used with your synth is disabled or adjust a filter in settings to disable CC and SysEx messages passing through. 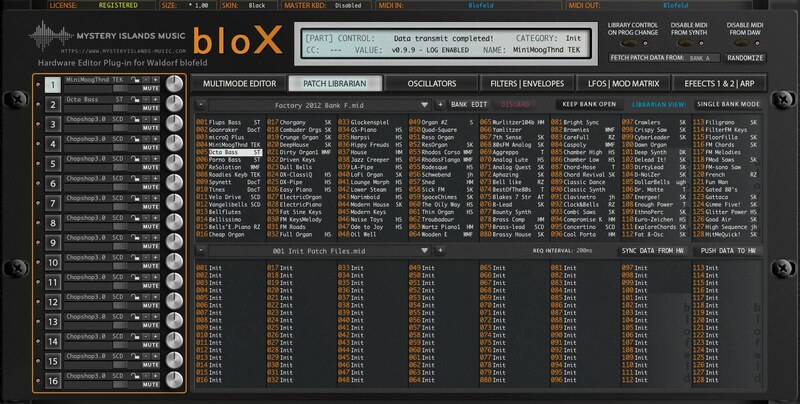 Load our bloX Plugin and select appropriate MIDI terminals from the upper right corner where your Blofeld is connected. Only MIDI in and out, MIDI thru is not supported. Plugin is now ready to receive and send data to your Blofeld. Fire up your Waldorf Blofeld. Make sure Global has Ctl.send at Ctl+SysEx and receive is on. Enable Program and Bank Changes. Make sure Device ID matches with plug-in and hardware. Blofeld is now ready to communicate with our plug-in. It is important to filter hardware MIDI messages coming from the Blofeld to avoid double processing the messages. Double processing happens when message is first received via the plug-in MIDI interface and then again from DAW MIDI interface. MIDI in Windows environment does not support recourse sharing (in most cases), so you would have to disable the MIDI ports from DAW anyway. More info in our MIDI message filtering thread. Check Downloads tab for detailed Synthesizer settings. Our GUI design is made to make everything from sound design to patch editing as smooth as possible. When you push a button or twist a knob in your hardware, software will respond at appropriate layer/part. All the edits are stored within the project, so once the project is opened up again, Total Recall will send the data to hardware automatically. 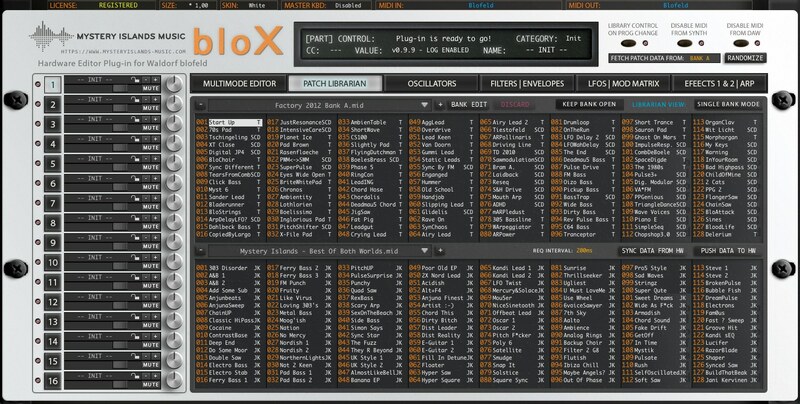 Check the bloX photos from the top to see different GUI skins. We created; black and white themes for you. 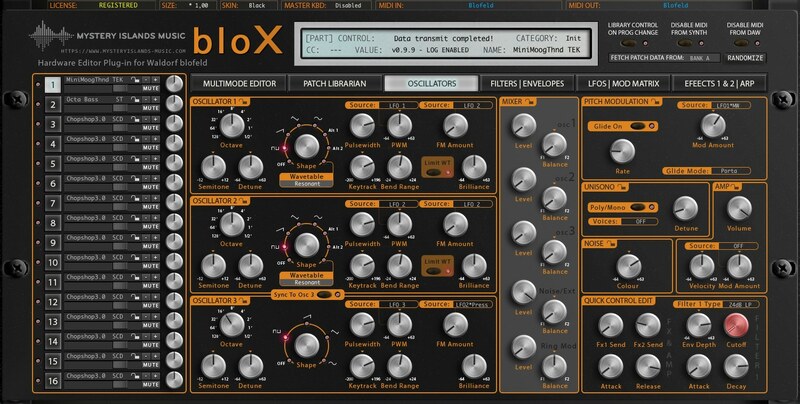 Waldorf bloX comes with ability to control all 16 parts from the plug-in. You can send patches from Librarian Browser to your selected part. Click desired part and double click a patch on the librarian to send the patch on selected part. Click different part number to send another patch for current part. Check Tutorials tab for more info about using the librarian. 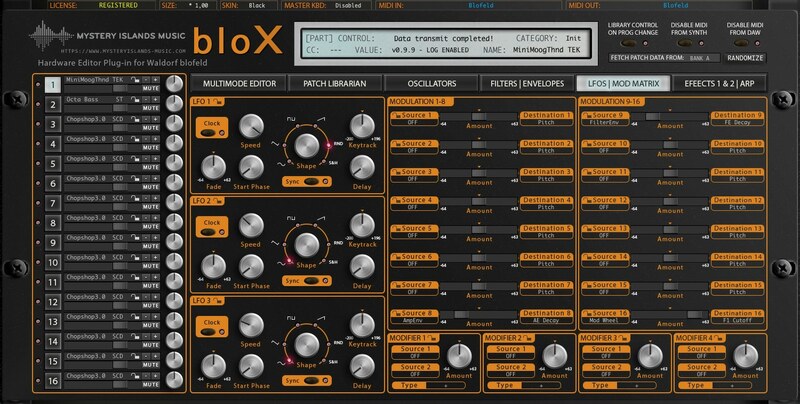 With FULL version of Waldorf bloX plug-in, you can automate almost every parameter right from your DAW without having to remember all of the CC's. To do this simply, put your DAW automation to write mode and twist a knob. Automation lane should appear and you can then freely adjust the automation with your mouse. SysEx parameters will not appearing in the automation list, due to the message data size being sent to hardware. This could eventually choke the MIDI interface stream and cause unwanted effects. Check Tutorials tab for more info about working with DAW automation. 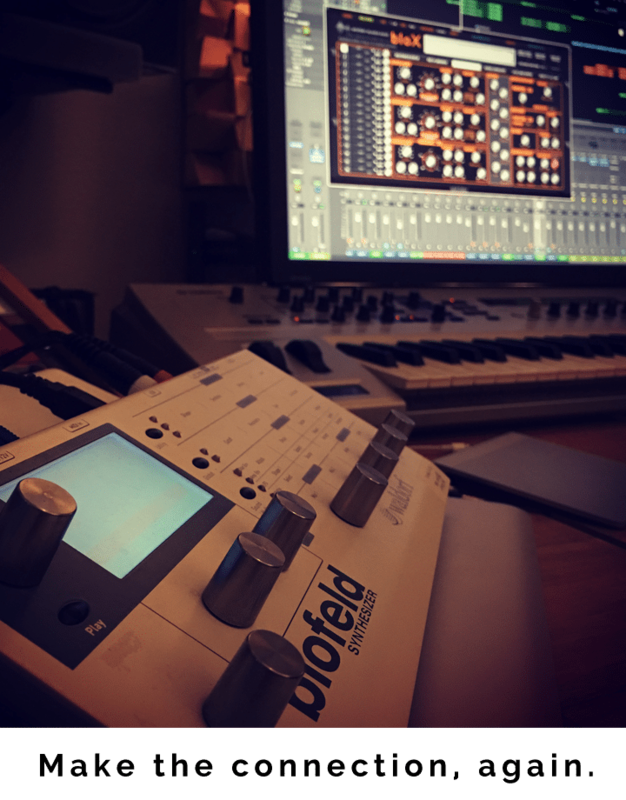 Control your Waldorf Blofeld series hardware synthesizer directly from your DAW. 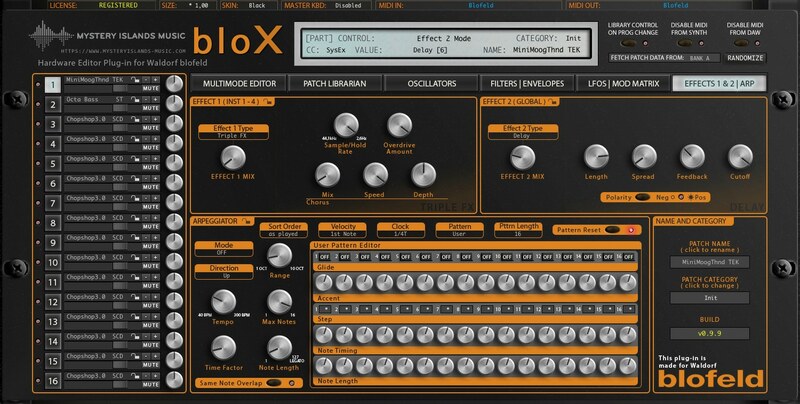 Edit almost every parameter of your synthesizer from single bloX plug-in instance. We added a bit more than 3000 parameters to the plugin (16 parts) so the sound editing should be painless and quick task. Automate almost every CC parameter in your DAW. Easier to handle automations than trying to remember hundreds of #CC’s. Layer multiple patches to create massive leads or such. Mute, adjust levels, panning, outputs and such from the plugin, per channel. Parameters that are available for automation will be listed on your DAW. (Ableton Live and other DAWs sees our parameters, when parameter is touched). Total Recall of the sounds used when loading project containing our plug-in. All of the current parameters from the plugin will be sent to the hardwares temp memory up on project reload! Time saver when thinking about storing, naming and loading data from multiple hardwares per project. Plugin reacts to hardware knob movements and displays knob, menu and button values within the plugin display. Store banks to your Blofeld-series from the librarian. Store patches to your Blofeld-series from the librarian. Request banks from your Blofeld-series to the librarian. Request patches from your Blofeld-series to the librarian. Store requested or modified bank data to your own library (on your HDD). 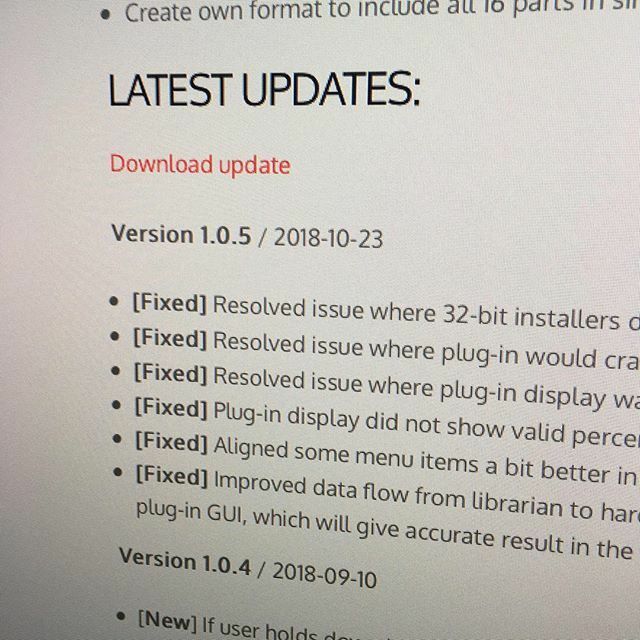 View & edit patch name in plug-in interface. View & edit category name in plug-in interface. Librarian supports MIDI and SysEx soundset formats across all Blofeld, microQ and Q models. Select next or previous librarian patch from hardware. Select next or previous hardware patch from librarian. Move patches from one bank to another and save as you like. You can send patches from the plug-in to your synthesizers Temp memory buffer OR you can write user memory slots through our plug-in. Download and import all of the Blofeld, microQ and Q series soundsets in one folder for quick access through the plugin. Each part can have its own patch. Each part has its own parameters which you can automate from your DAW. Transmit any audio. You have to plug your Synthesizers audio jacks into your mixer in order to hear the sound. You can not remotely start and / or shut down your Synthesizer. Since Windows platform CAN NOT share resources between applications, it is important that you disable the MIDI input and output from your DAWs settings which you are intending to use with our plugin. If you leave the port open, our plugin will see it and once you click to use it, it WILL crash your DAW and you will lose your data. Check our tutorials for videos and documents to get everything working properly! macOS works “out from the box” with resource sharing, you are good to go once you insert the plugin into your DAW. However, our plugin can cause you a MIDI loop if you leave the port open / unfiltered from your hardware to your DAW. You can set various filters in your DAW. (please refer to your DAW manual how to do it). MIDI interface (cheap interfaces & RME MIDI ports will not work). macOS 10.6 or later with AudioUnit or VST host. Windows XP or later with VSTi 2.4 compliant host. at least 1500×757 pixel resolution on your display. 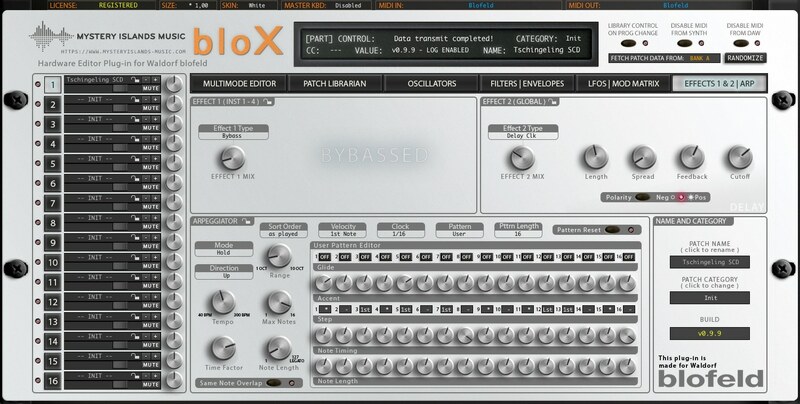 Mystery Islands Music bloX Editor & Librarian plugin for macOS and Windows platforms. AudioUnit and VST included for both, 32 and 64 bit DAWs. Personal activation key, which is downloadable from “My Account” page after purchase. Full access to free updates, which can be downloaded from "Downloads" page or Downloads tab after purchase. Mystery Islands Music “Best Of Both Worlds” Soundset included. 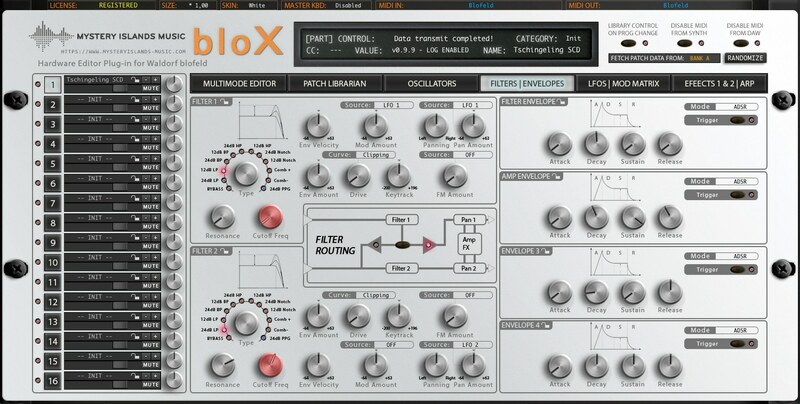 Waldorf Blofeld Factory Preset Banks included. ...or check the videos below! New users: download the DEMO version and give it a go! Some librarian functions are disabled. DEMO can not be registered. FULL version downloads will appear here once purchased and logged in. GlobalChn = we prefer to set this at channel 16. SysEx ID = 1 preferred. This will be auto detected once the MIDI in and MIDI out is set at the plug-in. Arp Send = your choice. NOTE: If Blofeld is your master keyboard, you might want to set Local Control to OFF so that sound in the synth won't change when controlling other plug-ins. Q: Do you accept Refunds? A: No. Since we deliver digital download product with lifetime license, we do not accept refunds. You should download the DEMO first to give it a go and read our guides through properly. Q: Does this plug-in generate sound? A: Not at the moment. You can only control the real synthesizer with our plug-in. In future, there might be PRO upgrades available, which will eliminate the need of the hardware completely and our plug-in works as a regular VSTi / AudioUnit / AAX instrument plug-in. Q: What are the plug-in requirements? You need the real hardware synth, which the editor is made for. 32/64-bit AudioUnit / VST host for Mac or PC. MIDI interface. A good one which supports SysEx messages. Don't buy anything which is less than 50€. Direct MIDI in / out connection between your synth and the MIDI interface. No MIDI Thru connections or MIDI in only / MIDI out only connections. Audio cables from the synth to soundcard or mixer in order to hear the sound. At least 1600x1024 pixels resolution. Q: Why my DAW crashes when I set MIDI in / out from the plug-in? A: Be sure to follow our instructions to setup your DAW environment properly before using our plug-ins. Q: Which functions are not available in the DEMO version? User can not save requested data from synthesizer to HDD. User can not store patches from librarian to synthesizer. Total Recall is disabled. This means, your last used plug-in settings will not be sent to your synthesizer up on loading the project. Plug-in parameters are not visible for DAW to automate. Demo version can not be registered. Q: Can I transfer my license to someone else or include it when I sell the synth? A: No. Once you purchase the license for the plug-in, you are solely entitled to lifetime support for the plug-in. It does not make sense to us, that once you sell the license, we would have to start supporting a new "client". Q: Can I use my license on multiple computers? A: Yes as long as the computer is yours. If we get support requests made with your license, by someone else than you, your license will be deleted. Q: Do I need a internet connection to activate the plug-in? A: No, you can purchase the plug-in license from our store and download the license.key and full installers and bring them to your offline computer for setup. Q: I just purchased the plug-in, where can I download the license? A: Click My Account and navigate to Orders tab. Once you are there, click on the order which contains the license for our plug-in and download from there. Q: How do I add the license.key for the plug-in to register? A: license.key needs to be located in /user/documents/mystery islands music/"plug-in name"/ in order to register. Reload your project or plug-in instance in order to validate. Q: Why plug-in says reload license after copying license to right folder? A: Plug-in has failed to locate the proper file or the license check failed. Make sure the license is called "license.key" in the plug-in folder and not "license.key.txt". If you see .txt appended, rename the file to "license.key" and try to validate again. Q: Where is the plug-in User Manual located? A: We do not ship / deliver PDF or printer version of your documentary. You can find all the details for setting up the plug-in and synthesizer from the plug-in respected forums. Q: Why plug-in displays DEMO version after purchasing the license? A: You need to download and install FULL version of the plug-in in order to register it. Check next question for instructions. Q: Where can I find the FULL version installer? A: Click Downloads or the product Downloads tab after purchase. Your FULL version installers should appear there. Q: Do I need to remove the DEMO before installing FULL version? A: No. FULL installer will overwrite the DEMO version from your harddrive. Q: If I place pre-order for upcoming plug-in product, will I have access to beta version? A: Yes. We will provide beta version of your product as soon as possible. Q: Is the pre-order charged upfront or at release date? A: Pre-orders are charged immediately. This is a great opportunity for you to save some cash before any sales take place and you will get early access to the plug-in. Not satisfied? Leave us a question via chat or head down to forums and create a new thread! 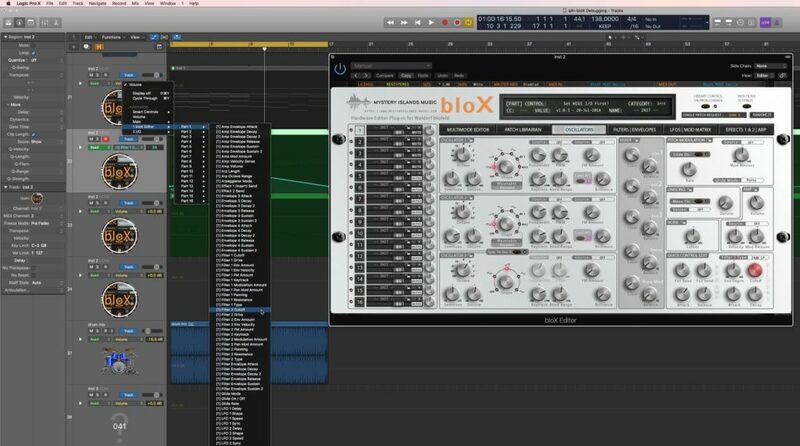 Use hashtag #bloxeditor to showcase your bloX plug-in usage! Love your products, but my #YAMAHA AN1x / PLG150-AN, CS6x, & SY-77 are feeling left out! Come to think of it, so is my #Roland V-Synth & SH32 & JD-xi & JV-1080, #Korg M1 & Z1 & Triton & Radias, and #alesis Fusion 8HD & Ion.